Tell me, who does not use generator in Nigeria? It’s now our trademark as the national electricity service is in its comatose state. From businesses to domestic, we burn petrol and diesel every day. Invariably, we are not only burning fuel, we have all been burning a chunk of our income. The recent hike price of petrol just killed the whole thing. We are now paying almost twice the previous amount for the same quantity of petrol. This was the unpalatable spark for me. I started looking for a way out. My first discovery was to know that I can use cooking gas instead of petrol. I was still thinking how possible it could be and how risky it would be to use cooking gas when I discovered I could even generate my own gas without buying the refined liquefied petroleum gas. Without prolonging the matter, we decided to save money even at the period when every other thing has jumped up in term of price.We have started using cooking gas at my home and office to run our generators instead of petrol. 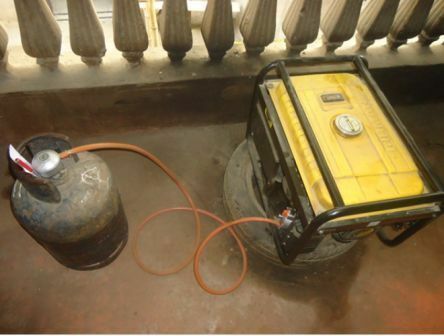 Here is the picture of our generator using cooking gas at home. If you look closely at the gas cylinder, you will see that some part of the cylinder is wet. The cylinder forms cool moisture around it and the moisture also indicates the level of gas in the cylinder as it is been used. People are often afraid that it can explode or catch fire that is not possible. The gas environment is even cooler than the petrol container of your generator. 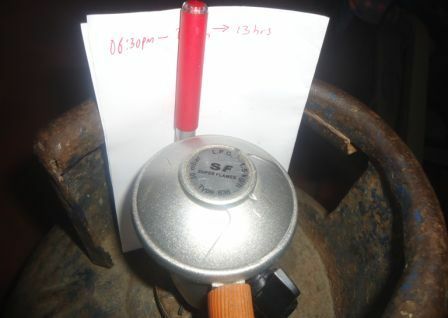 We hang a paper and pen on the gas cylinder to record how many hours it takes to run the generator with the gas in the cylinder. Here is the picture of the gas we are using to power our generator in the office. 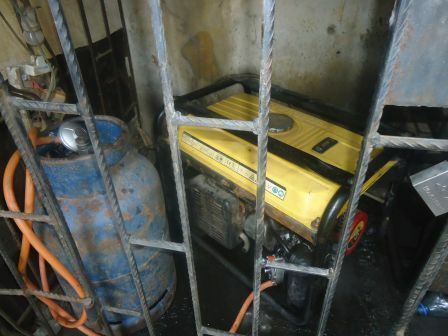 You can see how close the cylinder is to the generator and it has no problem. The miracle we experienced is this. Normally, we spend N2,000.00/day to power our generator at home from evening to the next day. You remember those heat wave days in Lagos? You dare not sleep without having your fan on. So, in 5 days, we usually spent approximately N10,000.00 on petrol. We were really burning of a lot of our income, but when we switched to cooking gas, using the 12.5kg cylinder of the LPG, which we refill with N2,800.00 (the price range is between N2,500 to N3,000), it took 5 days before it finished therefore, we saved about N7,200.00. When we convert the generator at office to use gas, it also last us for 5 days. We often bought petrol of N3,000 at 2 days intervals, Monday, Wednesday and Friday. So, we spent about N9,000.00 on petrol weekly. But with the gas, we saved about N6,000.00. Now we are on the project to start generating our own gas to run our generator and to cook at home. That is just exciting to me. 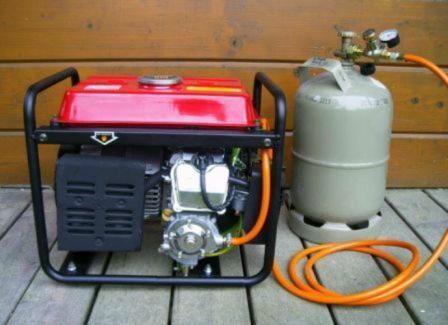 Will you like to convert your generator to use both petrol and gas? Do you like to save chunk of your income from constant purchase of petrol by using more efficient gas fuel? Will you like to get informed about our experiment to generate gas for cooking and powering of our generators? Then, you need to get this training D on how to do that without any technical expertise. This is still like a new idea, many people don’t know it is possible to use gas to power generator and that it is even cheaper. You will not only learn about how to install it we will teach you how to turn it to be a business which you can provide for others. How to do the conversion by yourself without any technical assistance from anybody. You will learn how to market the idea to other people and how to also install the device for them. We will give you tips on how to generate biogas which is likely going to be the futuristic idea of generating power and cooking gas at home. We will teach how to run this service as a business and make a lot of profit doing it even if you are not interested in handling the technical aspect of the service. (With millions of generators in Nigerians home, this can become a big business idea for you). You are just a click to get all the necessary details you need to grab your own copy of the DVD. The training is not just another junk but it will empower you and save you a lot of cost. I am sure the only regret you will have after discovering the secret is that it takes you too long to discover this. Kindly fill the form at the right side of this page to get full detail right away. Fill the form here to get details on how you can get started today. Enter your First Name, Surname, Email Address, Phone Number and Location now!